Dennis has now completed the inspection hatch in the new foredeck with the screw holes being drilled and the hatch cover and the threads being taped in the deck. He has also done the same with the bow thruster access hatch. The deck is currently only tack welded in place whilst Dennis levels it. 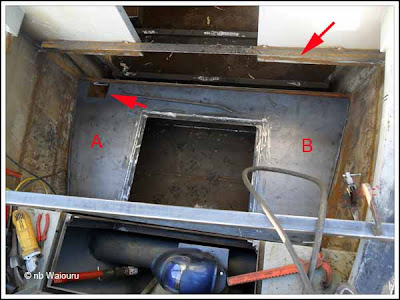 The red arrow in the upper left is pointing at the bilge sump which will eventually be inside the storage locker (A). The stove diesel storage tank will go on top of the deck at "B". Dennis has already fabricated the steel sections which will extend the forward bulkhead. The horizontal section of "L" section steel (upper right arrow) has only been tack welded in place. It's a temporary bracing strut designed to pull the bulkhead wall into alignment when Dennis welds in the extensions. The lowered foredeck will mean there will be only one step down into the forward cabin and there should be plenty of headroom inside the cratch.